It is said that the attention span of a goldfish is about nine seconds, or as long as it takes it to swim around its bowl. In the case of the Foreign Exchange market it is a little longer, but not much. The proof of this is in the attention given to the upcoming referendum on whether or not Scotland will become independent of the rest of Britain. Some short weeks ago the British pound was surging ahead against all its major counterparts, most notably the US dollar and the Euro. Then, during the month of August, a quiet time for the markets in any event, it started to stagnate. UK fundamentals had not dis-improved materially, so any softness could well have been attributed to a certain amount of uncertainty about the possible outcome of the referendum. Now, the plebiscite is two weeks away from this coming Thursday. 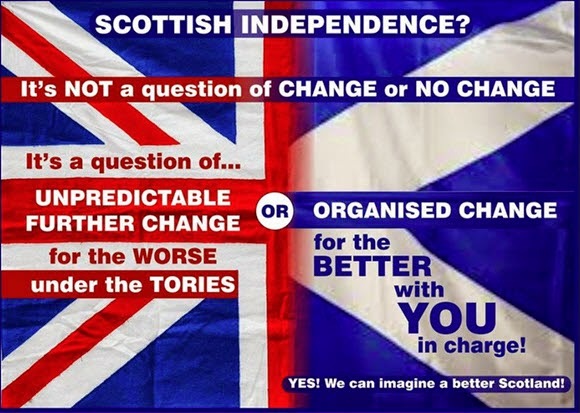 Yesterday, a poll carried out by the YouGov organisation suggested that the vote outcome is likely to be closer than had previously been predicted, with the possibility of independence being the chosen way forward coming more into prospect. So the pound went into a tailspin. It even lost ground against the Euro, which is saying something, as the Single Currency has been battered of late. This behaviour makes our decision to remain on the sidelines for the time being with regard to Sterling a good one. The outcome of the annualised GDP figures for Australia were released last night GMT. They came in at 3.1% growth for the year, a good result considering that 3.0% had been expected, but a little less than the 3.5% recorded for last year. In a speech, RBA governor Glenn Stevens declared that there will be no further interest rate reductions in Oz, as the housing market is in danger of overheating due to cheap loans. All of this has had the effect of maintaining the hitherto robust nature of the Aussie dollar exchange rate. Mr. Stevens thinks it is too high but is not, apparently, willing to do anything concrete to bring it down.